The U.S. second-in-command in Iraq said violence was down in Baghdad following the seven-month security operation in Baghdad, but that too many civilians are still dying. Lt. Gen. Raymond Odierno told reporters Thursday that car bombs and suicide attacks in Baghdad have fallen to their lowest levels in a year, and civilian casualties have dropped from a high of about 32 to 12 per day. He also said violence in Baghdad had decreased 50 percent. But he did not provide more specific timeframes. "What we do know is that there has been a decline in civilian casualties, but I would say again that it's not at the level we want it to be," Odierno said. "There are still way too many civilian casualties inside of Baghdad and Iraq." At least 26 people were killed or found dead nationwide, including three people who perished in a car bombing in Baghdad's Shiite enclave of Sadr City and the chief judge of the mostly Shiite Karrada district court. In southern Iraq, a representative of Grand Ayatollah Ali al-Sistani, the nation's top Shiite cleric, was assassinated late Thursday, police said. Amjad al-Janabi and his driver were traveling west of Basra when gunmen opened fire on their vehicle, police said. At least three aides to al-Sistani have been slain since early August; the killings were believed to be part of a Shiite power struggle. Tensions have also increased in the wake of Sunday's shooting incident involving Blackwater USA security guards, which Iraqi officials said left at least 11 people dead in Nisoor Square in western Baghdad. American and Iraqi officials announced they would form a joint committee to probe widely differing versions of the incident, which has infuriated many Iraqis. 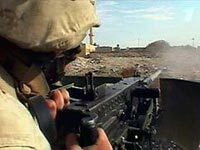 The New York Times reported in its Friday editions that the Iraqi government has concluded the Blackwater guards weren't fired upon and that the shooting was unprovoked. An Iraqi Interior Ministry report concluded that "the Blackwater company is considered 100 percent guilty through this investigation," according to the Times. The document also recommends the dozens of foreign security companies in the country be replaced by Iraqi companies, their immunity lifted, and that Blackwater pay compensation to the families of the victims.